A friend once told me when he was going through some difficult times that his wife counseled him never to let someone live rent-free in his head. In other words, if you have issues with someone, resolve the issue and do not allow it to weigh you down or preoccupy your thoughts. Preoccupation with a negative experience or negative person can prevent you from accomplishing your goals. It is wise to let go of the past so you can have a future. This essentially is the dramatic crux of The Railway Man, the story of Eric Lomax, a British officer captured by the Japanese in World War II. Sent to a prisoner-of-war camp, he is brutally tortured for building a radio receiver out of spare parts. Although his only goal was to hear news about the progress of the war that might lift his spirits and those of other prisoners, his captors view him as a spy and punish him savagely. The scars of that torture remain with him even after the war, giving him nightmares and horrific memories that disturb his emotional equilibrium. For many years, Lomax suffers psychologically because of his wartime torture. It is only after his marriage to Patti, a calming influence in his life, that he decides to confront the demons of the past so that he can have a normal life, free of frightening dreams that take him back to his Japanese incarceration. Eric discovers that the Japanese secret police officer, Takeshi Nagase, who brutalized him escaped prosecution as a war criminal and now works as a tour guide at the site of the old POW camp. Lomax travels there and confronts his old nemesis, threatening to kill him. But Eric is essentially a decent man unable to kill an unarmed man. His humanity touches his former nemesis, who reveals his sincere remorse for his actions so many years before. He reminds Eric that he did what he did because he thought his country’s survival was at stake. Only after the war did he see the objective cruelty of his behavior. What enables him to forgive Takeshi is Eric’s deep love for his wife, Patti, who truly wants Eric to move beyond his past suffering into a happy future. His abiding affection for her motivates him to transcend painful yesterdays and focus on the present. Patti never pushes him to confront his past; rather she gently and lovingly suggests that he needs to confront the past so that they can build a happy marriage, free of painful memories. She is the helpful, supportive presence that enables him to move forward with his life. When Adam marries Eve, the Bible uses a strange phrase to describe Eve’s relationship to Adam. The Hebrew phrase is ezer k’negdo, which literally means “she is a helpmate in opposition to him.” It is a contradictory and confusing description. The Sages explain the phrase as follows: if a man is worthy, then his wife will help him achieve his goals in life. If he is not, then she will work against him and prevent him from accomplishing his life’s goals. Eric is a worthy man, blessed with Patti as his wife, for she enables him to confront former times and become emotionally healthy for the balance of his life. Patti does not judge him or criticize him. She only seeks to help him, and she does this by giving him the psychic room to resolve the issue on his own. 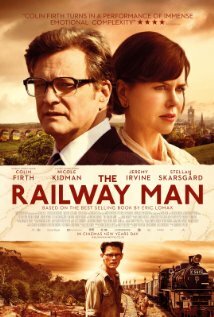 The Railway Man is a testament to the resilient spirit of man, which can often be attributed to the resilient and wise spirit of his wife. Do you have time this week to respond to a personal question via email? Sure. My personal email is rabbihjco@msn.com.